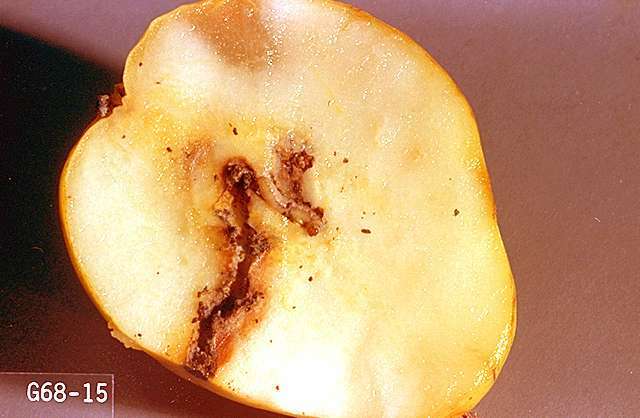 Signs and symptoms of a codling moth larvae infested apple. Note the brown material (frass) being pushed out from larval entry holes and the dark red discoloration about each hole. Pest description and crop damage This is the most serious pest of apples in the PNW, especially in warmer, dryer areas. Adult moths are 0.5 inch wide, with alternating gray and white bands on the wings and a copper band on the wing tips. Larvae are whitish with a black head when immature, and pinkish with brown heads when mature. Larvae are 0.1 inch long at hatch and 0.8 inch long at maturity. Pupae are brown and about 0.75 inch long. The eggs are very tiny and rarely seen. Larvae feed directly on the fruit, boring into it and feeding within. Stings are shallow depressions where feeding occurred and stopped. Larvae bore into the fruit, leaving a characteristic tunnel filled with frass that extrudes from the hole on the fruit surface. Entry holes may be anywhere on the fruit. Biology and life history Codling moth overwinters as mature larvae in silken cocoons (hybernaculi) spun under loose bark, in the soil, or in litter at the base of the tree. Pupation takes place in the spring around the time the first blossoms are showing pink, and adults emerge around bloom. Adults are active only at dusk and dawn and lay eggs on leaves, or occasionally on fruit. The larvae emerge, begin feeding on fruit, and may bore to the center of developing fruit to feed on the flesh and seeds. As they mature, they push frass out of the entry hole. After 3 to 4 weeks, the larvae leave the fruit to seek a sheltered spot on the tree to spin cocoons. The larvae may overwinter in the cocoon, or they may emerge in 2 to 3 weeks as a new flight of adults. These adults are active in July and August. In warm areas, there may even be a third generation. Larvae of this brood often penetrate fruit but do not complete development before harvest or the onset of winter. Sampling and thresholds The development of codling moth can be predicted by the accumulation of heat units, or degree-days using phenology models. By knowing the stage of the insect, we can target management to specific life stages that are susceptible. For codling moth, that means that our treatments are targeting the eggs or the wandering larvae during the brief period between egg hatch and the time when the larva is able to penetrate the fruit where it is protected. Phenology model recommendations can originate with your local Extension resource, crop consultant, software system, or use of an online degree-day calculator. It is important to make sure that you are using an appropriate tool/model for your region. Homeowners can also benefit from use of degree-day models to predict management timing. To calculate biofix for degree-day modeling hang traps with 1 mg pheromone lures in the upper canopy at pink. Biofix is the first capture of multiple male moths in a trap or consistent capture of multiple males over more than one trap. The biofix date is used as the point to start accumulating degree-days for the Stanley and Hoyt (1987) degree-day model, which is still the best model for PNW locations south of 46°N. North of this latitude, the no-biofix model can be used (Jones et al. 2008). The CM-DA lure contains a food odor and will catch females as well as males. Capture of females indicates potential for eggs and damage but models use male captures for setting biofix. When mating disruption is used, monitor the orchard with pheromone traps baited with 1 mg pheromone or CM-DA lures set in the upper third of the canopy. If more than five male moths are captured in a trap over the first generation, check the orchard for fruit damage or apply a conventional insecticide. If fruit damage exceeds 0.5% at the end of the first generation, use conventional insecticides to provide supplemental control against the second generation. If more than two male moths are captured in a trap during the second generation, a conventional insecticide may be necessary. In small orchards, sanitation by removing and disposing of young damaged fruit can be helpful in reducing codling moth. Check regularly throughout the season for fruit with frass-filled holes. Removing and destroying infected fruit prior to larvae emergence preceeding pupation can help reduce overall populations. Picking up dropped fruit from the ground likewise can be an effective sanitation measure. Homeowners can bag individual fruit (clusters thinned to one fruit) in paper bags approximately six weeks after bloom, however this can be labor-intensive and more challenging for cultivars with short stems. Fruit will mature completely within bags, however color development on red varieties may be affected. Homeowners can also place corrugated bands of cardboard around the lower trunk to attract larvae looking for a place to pupate. Place in May and remove before the adults begin to emerge in mid-June. The same technique can be used with the subsequent generation(s) later in summer. Apply first cover spray at 250 degree-days after biofix, or about 10 days after full petal fall (all petals are off) or 17 to 21 days after full bloom. 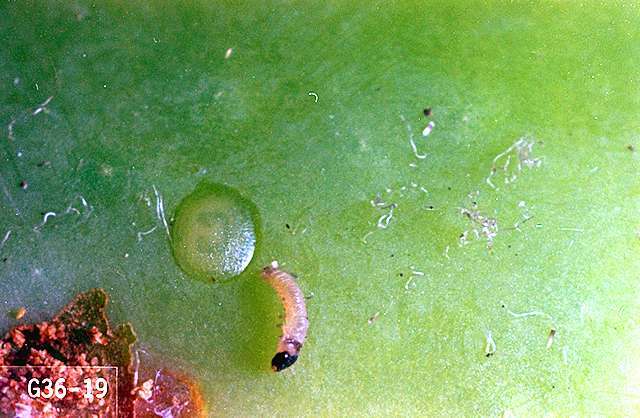 Insecticides must be timed to target newly hatched larvae before they bore into the fruit. Multiple sprays are often necessary with applications up to every 10-14 days, however sprays can be reduced by monitoring for adult moths with monitoring traps or use of degree-day models (see description above) to properly time insecticide applications to the hatching larvae during the growing season. kaolin-Applied as a spray to leaves, stems, and fruit, it acts as a repellant to pests. mating disruption pheromones-See biorational control above. Not effective for orchards less than 10 acres. Mating disruption. Pheromone release devices placed in the orchard interfere with the communication from female to male codling moth and this prevents or delays mating of moths, reducing the number of eggs laid and crop damage. A number of hand-applied pheromone dispensers are available including Isomate C+, Isomate CTT, NoMate, CheckMate, Cidetrak CM, and Checkmate CM-XL 1000. These dispensers are typically applied to trees at densities of 200 to 400 per acre, sometimes with a higher density of dispensers applied to orchard borders. Aerosol devices (also called puffers) for releasing pheromones are increasingly favored for their efficacy and ease of application at densities such as 1 device/a. Substantial fruit damage could result from improper use of mating disruption, therefore follow the label recommendations. Blocks placed under mating disruption should be large, ideally greater than 10 acres, and prospects for success increase when neighboring orchards are also using the tactic and the codling moth pressure is low. Pheromone dispensers can be applied to dormant trees and must be in place before first moth flight around the time of full bloom of Red Delicious. Place within 2 ft of the top of the canopy. If the orchard has a history of codling moth problems, use one or more insecticide applications against the first generation. If a codling moth source exists nearby, use border sprays (five to six rows) of insecticides. 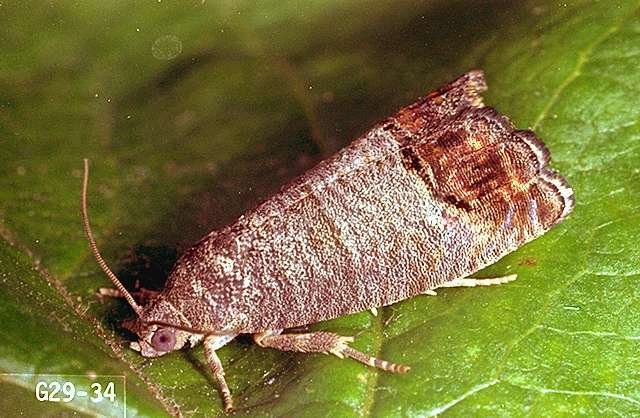 codling moth granulosis virus (Carpovirusine, Cyd-X, Virosoft CP4)-Check label for rates. REI/PHI 12 hr. Granulosis virus is a selective biological insecticide that must be ingested to be effective. Thorough coverage is important. The virus degrades when exposed to UV light. If a grower relies only on granulosis virus for codling moth control, frequent applications are necessary (every 7 to 10 days), especially when codling moth pressure is high. 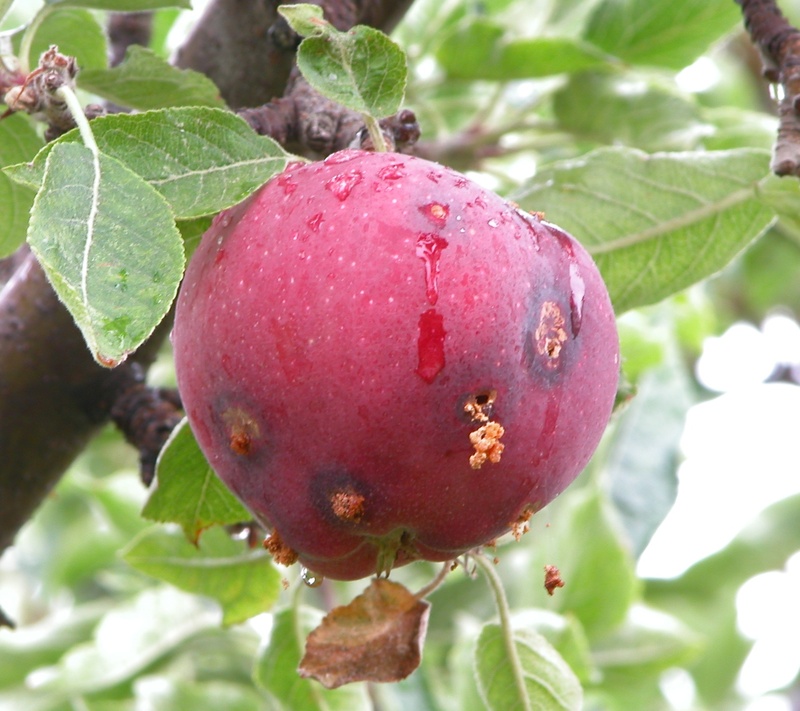 The virus controls larvae, but some fruit damage, primarily stings, may be evident. OMRI-listed for organic use. Apply first cover spray at 250 degree-days after biofix, or earlier for ovicidal materials. This roughly corresponds to about 10 days after full petal fall (all petals are off) or 17 to 21 days after full bloom for 'Red Delicious'. A second treatment is recommended approximately 14 days after the first (depending on residual) to cover the full period of moth egg laying in the first generation. The first summer generation spray should be applied at 1250 degree-days after biofix, and again a second treatment in 14 days will help cover the entire egg hatch period. Materials with rapid breakdown such as codling moth granulosis virus should be applied on a more frequent schedule. Chromobacterium subtsugae (Grandevo) at 1 to 3 lb/a. Under heavy pest populations, apply a knockdown insecticide prior to or in a tank mix, use the higher label rates, shorten the spray interval, and/or increase the spray volume to improve coverage. REI/PHI 12 hr. OMRI-listed for organic use. granulovirus virus M (CpV-M) (Carpovirusine) at 6.8 to 13.5 fl oz/a in 100 gal water per application. Start at the beginning of first generation egg hatch. Apply every 7 to 10 days. REI/PHI 12 hr. [larvicidal] OMRI-listed for organic use.